Given the recent spate of mediocre films, and with no major actors and a small budget, it was definitely an unexpected upgrade. Love scifi? Check. It's about a guy who gets crippled trying to save his wife from criminals, and then gets a chip (named "STEM") implanted into his spine that not only allows him to walk again but also to become a sort of "Ninja Terminator" to seek his revenge. Love gore? Check. Many scenes with some pretty gruesome bloody effects. However they are more in the "B movie" tone and theme, so it's more like cheering when it happens, not really scary or dark. Love humor? Check. Some great one liners as he deals with STEM - he is literally a voice inside his head, and he has to speak to communicate with him (STEM can't read his mind), so you can imagine that opens up a lot of funny scenarios when other people are in the room. There is a slight plot twist that isn't amazing but good enough to satisfy the overall story. But it's really better to just take the ride and follow his journey of becoming "one" with STEM, and the action packed second half as he kills his way to the person responsible for his wife's death. As mentioned it's got a B movie feel, so if you're into that sort of thing it's a clear win. But it's also really well crafted beyond what you'd expect from a micro budget - the fx were on point, music was solid, and the non A list actors stepped up. So it holds its own as a small but solid scifi pic. For long time fans, Solo gives you some fun, interesting "ah, that's why" moments. For new or very casual fans, that stuff won't mean all that much. Most fans however I believe will come away thinking it wasn't bad, but wasn't that great either. A bit like a glass of Uncle Owen's tepid blue milk. The plot is simple enough - we see Han as a young man trying to escape from his poor, on the streetliving conditions by joining the Empire as a pilot trainee. However, due to his insubordination, he ends up being a grunt on the ground instead, so he ultimately joins a band of thieves to pull off a big heist to set them all up for life. The pace and overall engagement really doesn't get into gear until Han meets Chewie about maybe 20 min into the film. At that point, the best part of the film imo - Han and Chewie's relationship - begins. It's funny stuff and Alden (Solo) is at his best when engaging with the big walking carpet. The two main action centerpieces of the film - the train heist, and the Kessel Run - were really well done. Hat tip to Ron Howard and the VFX crew for not only linking some great homages/eggs in it, but also making them stand tall on their own as well. Glover (Lando) channels Billy D Williams incredible well. In fact if you closed your eyes in certain scenes you could swear it was him. However it wasn't an "impression", which would have been corny. He had just enough of Billy in his performance to make you believe he would become the Lando we all know from the originals. Alden on the other hand wasn't as successful at channelling Harrison Ford. He didn't act poorly - he did fine and would watch him in other films - but he just doesn't have the same swagger/IDGAF attitude and overall screen presence the Ford had. He tries, but it wasn't convincing except when he was dealing with Chewie. That aspect of Han he nailed. Sure, you can say he hasn't formed into the Ford Solo yet so he shouldn't be the same, but Glover showed you can still show the spirit of the person and be convincing. Woody Harrelson was tried and true Woody Harrelson, playing the "Obi Wan" of thieves (a good thing). I think they could have played into that even a little deeper into the lore, but overall it worked. Emilia Clarke did fine for what she was given, but the role itself felt a bit shaky. Also I'm not sure she was the right choice for it. (don't want to throw any spoilers) Suffice to say that she will be faced with the Mother of Dragons label for a long time to come given how ingrained GoT is in the pop culture and how well she plays that character. Maybe she'll get a chance to evolve it if there is a Solo 2. And finally, the twist. Can't say what it was, but you'll know it when you see it. Didn't see that one coming from 12 parsecs away. That said, there just wasn't enough beyond a few fun moments and the heart warming fan service to push Solo into being on the top shelf in the Star Wars library. It didn't go far enough into any direction - funny, dark, mythology - to give it teeth. We don't know what the original directors were going for, but it's clear that Howard was brought by Disney in to make a "safe" version. On that level it succeeded, but given the less than stellar reviews, the Big Mouse may need to loosen his grip or more viewers will slip through his fingers. I didn't read the book so I didn't know what to expect, but as a huge fan of Spielberg my expectations were high. Unfortunately, while pretty, it just didn't have the Spielbergian Magic. In fact it just wasn't a very good film. The biggest overall problem? No stakes. In the Matrix, when you die, you die. In RP1, when you die you "zero out" and have to start all over again. Boo #$&! hoo. This is a massive issue that is core to the story. I don't know how the book deals with it, but here it just prevents you from giving a damn. So when a major character is about to die in the Oasis, the attempt at emotion falls completely flat. And the use of epic music only makes it come off as cheesy at that point. Really surprised Spielberg didn't see that in the edit process. We really get just a hand wave at getting to know Wade's back story, the main character. We're told his parents are dead and his trailer trash aunt is raising him, but it lacked any emotional depth. We don't see him suffer or show any issues, so again it felt thin and stakes were missing. The goal of the evil corporate bad guy? Putting ads on your HUD as you play the game. Oh the horror!!!! Again, no stakes. And as good as Ben Mendelssohn is, he can't save the way his character was written. One dimensional and bland. The soundtrack was way over used and didn't have the right highs and lows. Alan Silvestri is the composer (love his work) but the way it was edited just didn't build any tension or magic. What's so confounding about this is that Michael Kahn is the editor, and he's been with Spielberg since Jaws. He's amazing but blew it here imo. And maybe there's something about not having John Williams. Those two are peanut butter and jelly. One without the other just isn't as good. Which brings me to the tone. It just couldn't consistently find it. It was high energy and fun in the beginning (the opening race is absolutely incredible), then it tried to get you emotionally engaged, but didn't succeed. And he is usually so good at creating that magical, childhood feel yet here he misses. He tries to make it happen in the end scene (and I was really trying to climb on board) but by then it's too late. The script just didn't set it up for the payoff. It's almost like he rushed the final cut. It needed to breathe at points to develop the bonds to the main characters and create the tension and wonder. And when he does let things breathe a bit in the final scene, I felt like where was this earlier? As for the dialogue...ouch. Was George Lucas bad at times. Finally the one thing that I don't love about Spielberg is his tendency to hit you over the head with the message, by using waaaay too much exposition. He has at least 4 or 5 "hand clap" moments where the main character gives a morality speech, etc. Usually his films are so good I can look past this but here it just doesn't have the wiggle room. That all said, it was not a terrible film. It was visually cool (as mentioned the chase scenes were fantastic), had tons of nostalgic value (especially if you're a gamer), and there were some genuinely funny moments. But when the main character cries in the end, I literally felt zero connection to it. It was completely unearned, and for a master like Spielberg, that's just not acceptable. He knows better! It's Matrix meets Willy Wonka meets Wreckit Ralph, and it almost feels like maybe it should have been made by Pixar. They are masters at telling animated stories that have multiple layers, and maybe they could have spun this in a way that worked. But here it's game over, man. Took me a long time to finally see this film but I'm really glad I did. And, as with almost every film they produce, Pixar delivers on their motto, "Warning: Kleenex required". 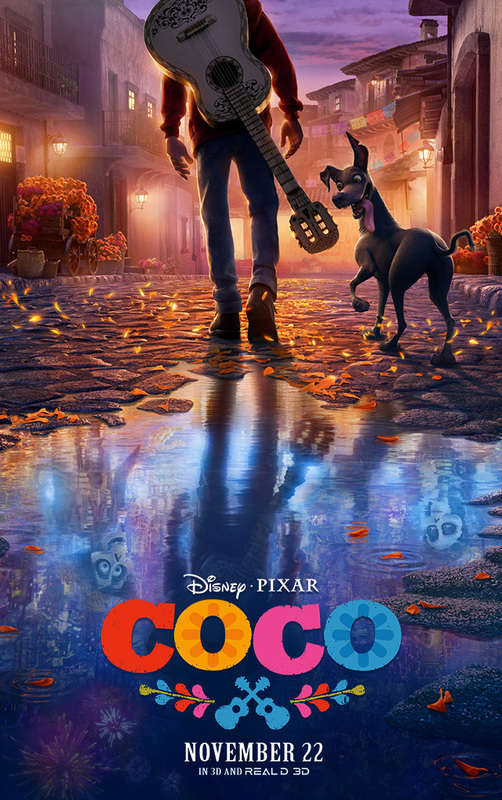 The story focuses on a small Mexican boy who loves music, but is banned by his family from playing because his great, great grandfather abandoned the family to become a famous musician. Not to be stopped by his passion, we follow his journey to the world of the undead on the Dia de los Muertos celebration where he meets former family members and the twists and turns follow. The pace of the story is for the most part good, with just a little dead weight here and there. The plot is pretty simple on the surface which helps move things along fairly well, albeit with some unevenness. Lots of humor - the sidekick, stray and messed up dog, Dante, is hilarious. But as with all Pixar films, there is also plenty of subtext to be had, and that is what makes their films classics. Once the twist is revealed it steps into another gear. A pretty dark one at that too, for Pixar. But it was a great way to hammer home the message. And there's no shortage of loss in this film either - when it happens, how it happens, you will be reaching for the kleenex if you have even the slightest hint of a pulse. Its RT rating is 97%, which I think may be a bit high (I would put a few other Pixar films ahead of this). But given I wasn't able to leave with a dry eye (damn you guys...again), it could be argued that's what ultimately counts. If it hits you that hard in the feels, mission accomplished.